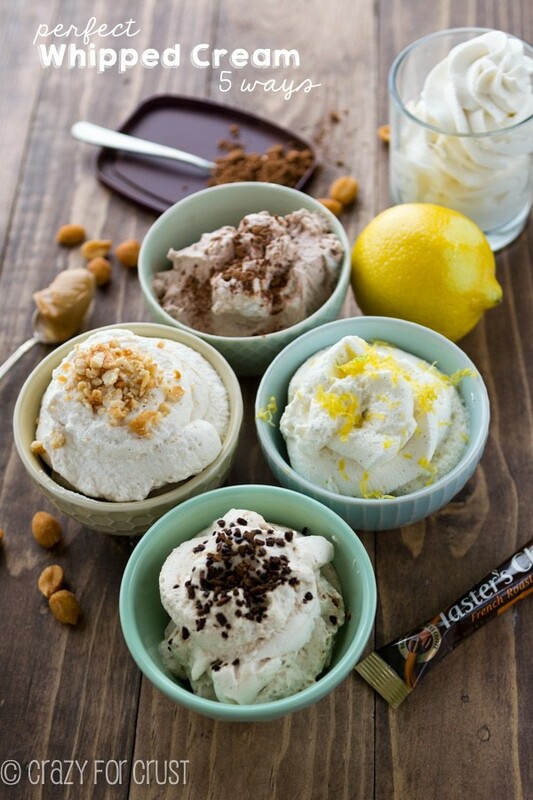 This Marshmallow Whipped Cream is more than just whipped cream. It’s a dip, a pancake topping, a frosting, and something you hide in the back of the refrigerator so you can eat it with a spoon and not have to share. Something BIG happened in Hawaii last week: I put my head under water 3 times! Right now you’re thinking, okaaaaaay…isn’t that what one does at the beach? Me? No. At the beach (or pool) I normally park my bottom on a chaise lounge and read a book. In fact, I spent 7 hours one day doing just that while Mel and Jordan swam. If you remember, I don’t like submerging my head under water. People think I’m weird, but I always end up with water in my ears and up my nose that gets infected. I even have trouble when I get my hair colored, so it’s a thing. On this trip I took one for the team and I snorkeled and surfed. Both of those things? Involve getting water (and sand) everywhere, in case you were wondering. I’m now paying the price for those experiences (hello, swimmer’s ear induced vertigo) but it was totally worth it. The other thing I’m paying the price for? Overindulgence. One of my favorite places to eat was The Gazebo in the Napili Beach area. I’d heard wonderful things about their pancakes and fried rice, so that’s what I ordered, and I demolished them. You would have too, see how good they looked? When you look at that photo, you’ll notice a huge gob of what looks like butter on top of the pancakes. You guys, it wasn’t butter. It’s The Gazebo’s “secret” pancake topping. I tasted a bite and guess what it tasted like? Marshmallow Whipped Cream! OMG you guys, I just wanted a whole bowl of that for breakfast. The pancakes were awesome too (copycat coming next week) but the fluffy cream on top? OMG. Obviously it was the first thing I made when I got home. And I’m serving it in a bowl, like it was supposed to be served. 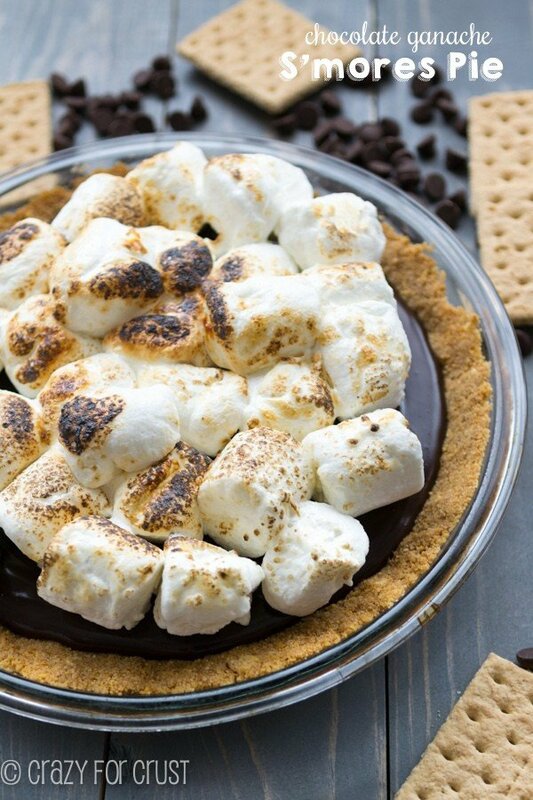 This is a super simple recipe with only 3 ingredients: heavy whipping cream, marshmallow fluff, and vanilla extract. You simply beat the cream halfway to whipped cream (soft peaks) then add the fluff and whip until it’s a bit stiffer. The end result is a soft and fluffy marshmallow whipped cream! This whipped cream is not as stiff as normal whipped cream, but it’s the perfect topping for pie, cake, ice cream, or pancakes. But I like to use it how I think it was originally intended: as a dip. For a spoon. Or fruit, if you want to make it all healthy and stuff. But where’s the fun in that? 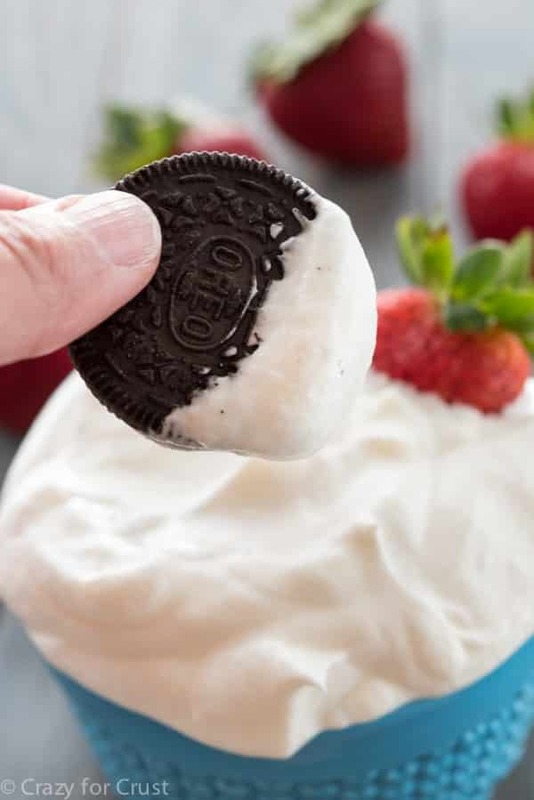 Dipping Oreos in marshmallow fluff whipped cream is so much better. Don’t you think? 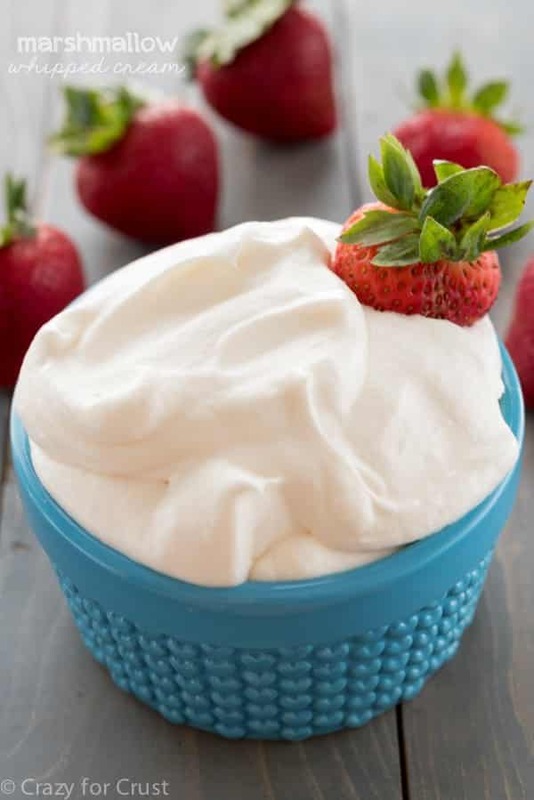 This Marshmallow Whipped Cream is the perfect dip for fruit or cookies and it's the perfect topping for pancakes, cake, brownies, pie, and ice cream! Beat cold heavy whipping cream on high speed using a stand mixer or hand mixer. Beat until soft peaks form (the whipped cream has thickened slightly but does not stand up on its own). 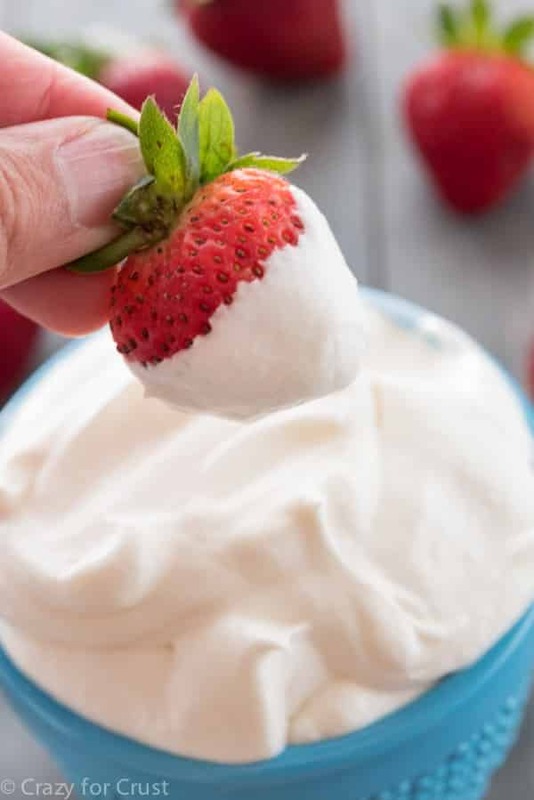 Add the marshmallow cream/fluff and vanilla and continue whipping on high speed, scraping down the sides of the mixer as needed, until a loose whipped cream forms. The end result will be stiffer than soft peaks but not all the way to a hard peak. Use as a dip for fruit or crackers or as a topping for pancakes, pie, brownies, ice cream, or cake. 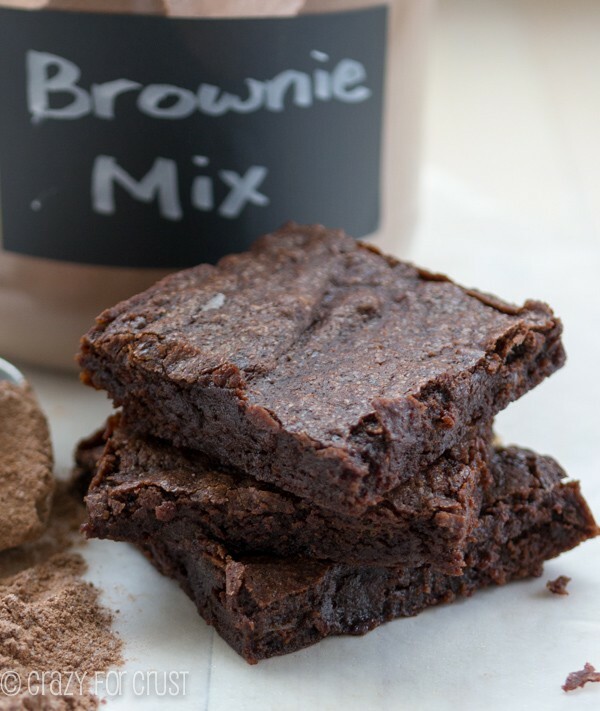 The perfect brownies and brownie mix! Does this get watery used as a frosting? Would it be possible to also toast this whipped cream in the broiler for the sake of making it toasted marshmallow flavor? Or does it sound like a disaster that shall be avoided? Hi Sandra! I don’t think that would work because even though there is marshmallow in there, it’s still whipped cream. If you want the toasted thing, I’d go with a meringue. Or you can try toasting the marshmallow cream before mixing it in, but I’ve never tried that. Thank you very much for the forewarning, Dorothy! I will definitely consider toasting the marshmallow cream before mixing with the whipped cream. Hi Dorothy, I hope your still checking your comments now and then. Today of course is the 4th of July and I bought a lot of fruit and wanted the fruit dip in the worst way. So I checked Pinterest and found a few but the one I tasted a while back did not have Cream Cheese in it, it didn’t taste cheesy (woman did not want to give me the recipe) and I’m talking over 5 years ago. So I’m so lucky I found yours, this seems to be the recipe, very light, no cream cheese. Some others put in Conf. Sugar, but I am going to make yours after I’m done typing. Talk about vertigo and hating your head under water. I hate swimming, like to lay on a raft but will never swim. I have Benign Positional Vertigo for more than 8 years now. An ENT doctor did some type of procedure and it worked for a while, but when my allergies start up or when I hang my head down (while gardening) it starts acting up slowly all over again. I have got to the point where the throwing up lasted for hours. I have fell down to the ground because of being so dizzy. I had to retire because it happened to me so many times and it takes its toll on me. Since I stopped working its been less and less. Thank you for your recipe, I know this is the one that I want and can’t wait to taste it. Oh my gosh I’m so sorry to hear about your vertigo. That’s horrible! Allergies and hanging your head down, totally sounds like me. My allergies are fierce right now, and I swam again this year in Hawaii and it’s threatening to come back. I’m upping the sudafed until I dry out! Will it hold up for topping pies if I make it the day before the holiday? I made this to top hot chocolate, and it was ridiculously delicious. Fluffy, rich, sweet, and creamy, it was positively perfect! I tasted it after I was done and it was yummy. I did add 2 things after tasting only because it was sweet and I felt needed a little something to enhance it. I added a pinch of fine (table)salt and a teaspoon of melted but cooled real butter. Whipped it back up on high. Wow if I could have I would have consumed the whole thing.